That is about as perfect of a basketball game that I’ve seen Providence College play under Ed Cooley in his time as the head coach of the Friars. With the fear of a potential trap game at the very back of everyone’s mind after a hard fought and emotional win against in-state rival Rhode Island on Saturday, a much smaller Brown team loomed for the Friars tonight. The fact that Brown was able to steal a game against PC just two years ago (Ed Cooley’s only non-conference home loss as the Friars head coach) made every Friar fan a little uneasy at the tip. Fortunately, even the most remote thoughts of a possible upset were put to rest almost immediately. Following a quick three from Brown to go up 3-0, the Friars scored 20 unanswered points on route to a bloodbath of a game at The Dunk. PC was able to get all the way up to 95 points, the most that they’ve scored in a game since 2010 against Seton Hall. Buckets were easy to come by for just about everyone, especially Emmitt Holt, who was an uber efficient 9 of 10 from the floor for 20 points (his second 20+ point game of the season). The real calling card of this season for the Friars has been their stifling defense. They put that on display tonight en route to a 38-point win over an over matched Brown team. Providence is now 95-29 all-time against Brown, their most wins against any opponent. The Friars continued their hot hand from behind the arc following up their 12-21 effort against URI with a 14-27 (51.9%) effort against Brown. Not to be out-done, they also shot 61.7% from the floor in total. They did struggle from the line, shooting just 7-14 (50%), but it didn’t much matter in this one. 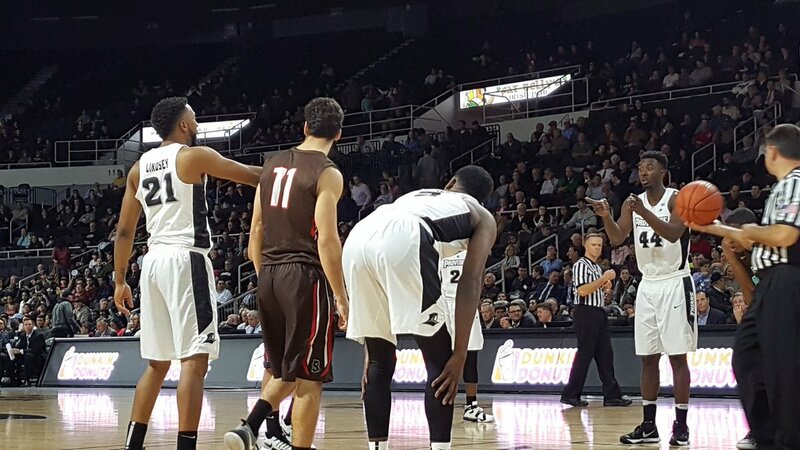 The Friars held Brown to just 37.3% from the floor and a stingy 17.6% (3-17) from three. Emmitt Holt played basically a flawless game, going 9-10 from floor after missing his 10th and final shot of the game. He also was 2-3 from distance, marking the first time that he has hit multiple threes in a single game this season. The corner three where he drags his defender out to the perimeter and is left with space for a kick out are the threes that he should be taking this year, not contested ones from the top of the key. Holt was able to score in a variety of ways, including a runaway dunk. Holt also added 5 rebounds and 5 assists in just 26 minutes of game time. Bullock continued his streak of scoring at least 16 points in every game so far this year, shooting 7-12 from the floor, led the team in rebounds with 8, and added 5 assists for good measure, the prettiest of which featured the patented Rodney Bullock pump fake that we’ve become accustomed to seeing this year. We were treated to the one other thing that Bullock has become known for so far in this short season…the Bullock War Cry after a dunk. And there were hockey assists for days on this one. A lot of the Friars success this year has been put on Bullock and his improvement from last year to this year, increasing his scoring by 10 points a game from the previous season, but I think what Jalen Lindsey is doing is equally as impressive. Lindsey was 4-5 from three and finished with 16 points. After shooting just 26.9% from three last year, Lindsey has improved to shooting 45.5% from three so far this year. Considering he had 145 three point attempts last year, thank GOD that he improved his shooting percentage this much. On top of that, Lindsey has become the best defender on a Friars team that is becoming known for their defense. We got to check that out on an incredibly athletic block. I think this is the longest I’ve ever gone in a recap this season before mentioning Kyron Cartwright. He is the engine that powers this team and his aggressiveness to push the ball early in this game is the reason that the Friars were able to distance themselves from Brown so early on. Cartwright barely even saw the court in the second half with the game already in hand, tallying only 22 minutes in this one after playing 39 against URI. Kyron only shot two field goals in this game but his style of play was contagious and spread to everyone on the team. Every player seemed to be making the extra pass, passing up a good shot for a great shot. The Friars recorded 24 assists on their 37 field goals. Oh, and if you didn’t already know, Kyron is pretty quick. I thought Isaiah Jackson had maybe his best game of the year as well. I guess it’s easy for so many guys to have their best game when you blow out a team with a combination of great offense and great defense. The young guns were able to get some run in this one that may help the Friars depth out later in the year. Kalif Young took advantage of the Brown Bears small size to the tune of 9 points and 6 rebounds in just 14 minutes of action. I thought Maliek White looked the best that he has all season. He was able to fill up his stat sheet in the extended playing time opportunity with 5 points, 4 assists, 4 rebounds, and 2 steals. Both Fazekas and Edwards looked comfortable in their rotations as well. 9 players were able to connect on a 3-point ball: Holt, Bullock, Lindsey, Jackson, Council (yes Council), Edwards, Fazekas, White, and Woodring. The Friars were able to finish off the game with their death lineup including both Casey Woodring and Tommy Planek. Next Up, the Friars continue their homestand at The Dunk and face off against UMass on Saturday at Noon. The game will be shown on FS1.